Remove the steaks from the refrigerator and allow them to come to room temperature. Season steaks generously on both sides with salt and pepper. Press the salt and pepper into the steaks. Set aside. Make the garlic paste: Trim the stem ends off garlic cloves. Place a small skillet over medium heat and add 4 tablespoons of the oil. Add the garlic cloves and bring the oil to a simmer, then reduce the heat to low. Strip the leaves off 2 sprigs rosemary and chop to make 2 tablespoons. Add the rosemary to the garlic and cook until the cloves are golden brown, about 10 minutes, tossing occasionally with tongs. Remove the skillet from the heat and allow the garlic to cool in the oil. In a mortar or on a cutting board, mash the garlic into a paste. Mix the mashed garlic with the reserved oil and rosemary. You should have about 1/2 cup of paste. Place the meat on a hot grill and cook until well browned on both sides, about 5 minutes on the first side and 3 minutes on the second side. Cut 2 lemons in half and cut ends off. Brush with olive oil and season with salt and pepper. Place the lemons on the grill with the steaks and serve with the steak. Smear 2 generous tablespoons of the paste over the first seared side of each steak. Place the steaks, paste side facing up, on the grill rack. Finish cooking on the cool side of the grill, with the lid on or in the oven until done to your preference, 10 to 12 minutes for rare (remove when an instant-read thermometer registers 120 degrees F). Remove the steaks from the grill and allow the steaks to rest on the rack for about 10 minutes. Cover and keep warm while resting. 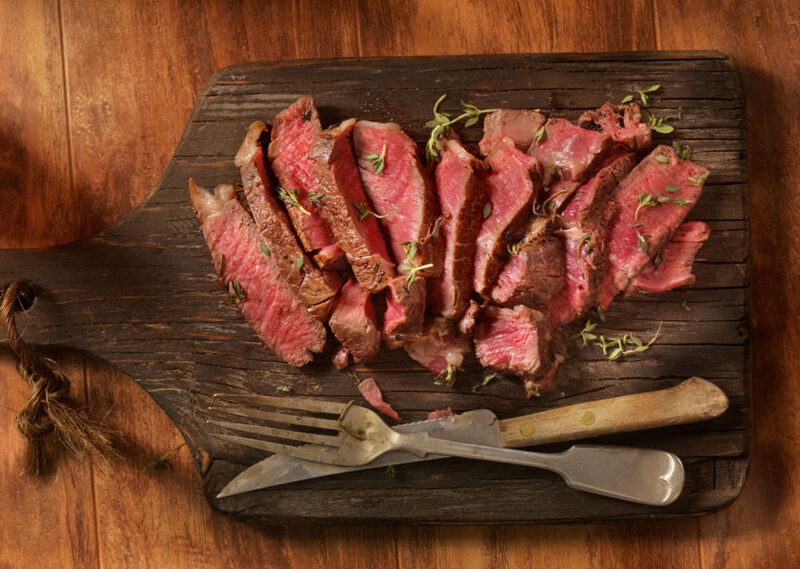 Transfer the steaks to a cutting board. Cut between the bone and meat of each steak. Cut each steak crosswise into 1-inch slices.